Yesterday the touch of the frolicsome breeze seemed harsh, my beloved, and the sun’s beams seemed weak, a mist hid the face of the earth, and the waves of the ocean roared like a tempest. I looked all about me, but saw naught but my own suffering self standing by my side, while the phantoms of darkness rose and fell around me like ravenous vultures. But today Nature is bathed in light, and the roaring waves are calm and the fogs are dispersed. This week has not been a good one. In fact, the last few weeks have been full of fog and rough waves. Work, sleep, health, guilt, work, stress, late, cold, obligation, forgetting, fears, thoughts, hurry, work. Sometimes life seems to be moving so fast and racing thoughts fly by so quickly that we are lucky to be able to reach out to grab hold of one to focus on. Get an oil change, clean the house, make dinner, get the project done, get all the other projects done, go to the meeting, worry about the future, get up early, stay up late, remind your family you still love them, remind your friends you still love them, send a thank-you note, pay the bills, hold it together, get a haircut, do the laundry, and don’t forget to try to do it all without getting into the car and driving off a cliff like Thelma & Louise. This past week, I was saved by two thing: my mother and delphinium. My mother and I had a plan; a mission. Within thirty minutes of her arrival, our plan started to crumble and it never stopped crumbling. But with my mother, everything is meant to be. She was like an angel in a baby blue wool jacket, setting our new course and reminding me of all the important things. “Get back to basics,” she said. “One thing at a time.” And when I would veer off course back into the rough waves, she sat with me and talked things out. “Without your health you have nothing,” she emphasized. “We can be our own worst enemies.” Then of course, “You have so much to be proud of and you are so loved.” This leads me to my next bright spot. I came home from work one night this week and found Chris cooking away in our kitchen, a glass of wine poured for me, and the most beautiful bouquet of blue delphinium I’ve ever seen. He knows more than anyone how much I miss my garden in the winter. Could it be the numerous boxes from Amazon containing gardening books lately? The hour that I spent, tiny little brush in hand, trying to help our hydroponic cherry tomatoes pollinate? The three hours I spent at our table with a sketch pad and colored pencils, drawing out the plan for our garden? The way I continually flip through a seed catalog, reading all of the descriptions? Or perhaps it is the nearly pathetic way I flip through the packets of seeds over and over and over and over? He must have decided it was high time we had some real flowers in this house to offset the dirty white snow outside and the dying container of thyme by our kitchen window. I, for once this week, didn’t blubber though I did feel a lump in my throat at this small, yet enormous gesture. He hasn’t had a very easy few weeks himself but he wanted me to know that he thought of me by driving around to try to find my favorite flowers. The waves will calm down and the fog has lifted a bit. How lucky am I? Did you realize that now is the time to start your delphinium seeds indoors for spring planting outdoors? First, freeze the seeds for about 2 weeks, but do not freeze the dry seeds! You’ll want to place the seeds in MOIST light soil meant specifically for starting seed, then place 1/4 inch of soil on top of the seeds prior to freezing. When you take them out, make sure the soil doesn’t dry out and germination takes about 12 days. As your little seedlings grow, it is best to mist them or water them from the bottom up. I found this post so inspiring, it cheers you up on a cold winters day, it really did put a smile on my face. I really love the colour of the delphinium, blue is one of my favourite colours!!! Thanks Anthony! 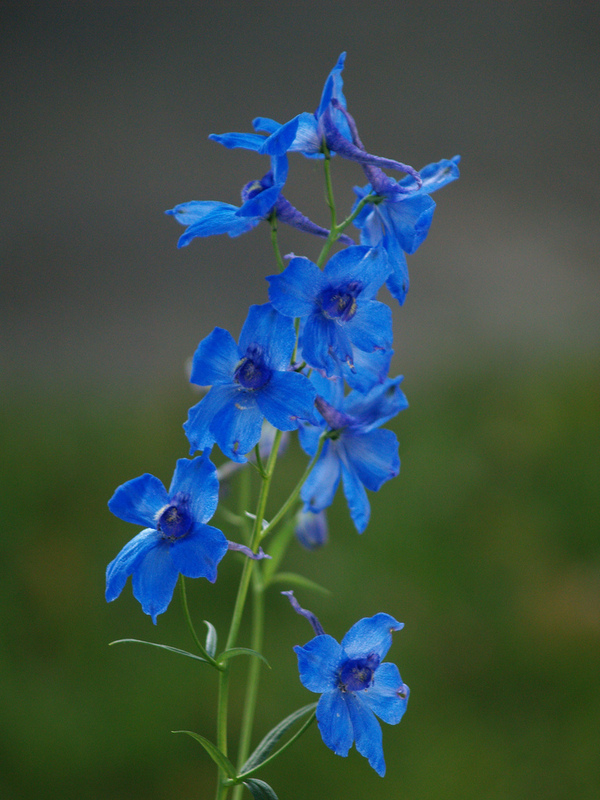 I am in love with blue delphinium as well. I can’t wait to see them in real life this summer. I appreciate your kind thoughts.